John Hardy hoop earrings from the Dot Collection. Sterling silver hardware with 18-karat yellow gold. 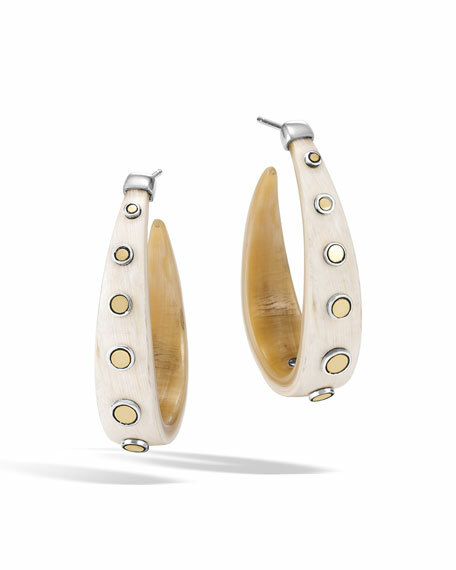 Tapered buffalo horn hoops with yellow gold dots. The classic John Hardy Dot is one of his most recognizable collections. The designs are distinguished by a highly patterned texture that is both geometric and rich. This collection has evolved into rhythms of graduated 18-karat gold and sterling silver dots individually applied by hand. For in-store inquiries, use sku #2450529.